Sprayway says:"Waterproof, lightweight, packable jacket suitable to a variety of outdoor activities and travel." 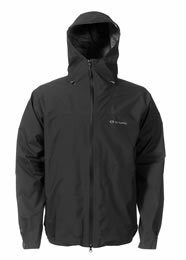 I've worn the Sprayway Anakin Pro Shell Jacket for Men (in combination with the Sprayway Anakin Pro Shell Pant for Men) during some lengthy walks in the Peak District and the North Pennines during the Autumn months. The weather during these trips has been predominantly showery and windy and damp. I also had occasion to wear this jacket over a bulky down (non-waterproof) jacket on a particularly cold and wintery day. When compared to the ubiquitous Gore-tex XCR fabric (which was replaced late 2007) the new Gore-Tex Pro Shell fabric is lighter and less bulky which results in a very light-weight waterproof jacket that packs down easily into its stuff-sack for easy stowing and retrieval. The fabric is also smooth with a much nicer feel that glides easily over my other layers. Crucially, the Sprayway Anakin Pro Shell Jacket for Men certainly kept me dry, even during the heaviest rain. With regard to breathability this jacket was OK most of the time but when I put the jacket under a heavier load (like climbing steep tussocky grass) I would have liked some additional ventilation options like pit-zips or side vents. The only means of gaining additional ventilation was by opening the front zip - which somewhat defeated the object when it was raining hard. The overall fit is good (I'm male, 5'11", stocky build - I was wearing an XL) and the jacket includes plenty of room for a variety of mid and base layers (including a bulky down jacket as mentioned earlier). The hood is adjustable with an elasticated hem and volume adjuster at the back. The face-guard fastens nice and snugly to keep out the worst of the weather. There are two side pockets which are both accessible when wearing a belted backpack but, as is common with this type of jacket, neither are 'dry' pockets. Less common with this type of jacket though was the complete lack of an internal dry pocket (for car keys, mobile phone, wallet etc) or a pocket big enough to take a folded OS map! During my trips I had occasion to walk through plenty of overgrown vegetation and, despite the very thin and light-weight feel of the fabric, it appears to be perfectly durable. Superbly light-weight, easy-to-carry, water-proof jacket that will keep you dry in even the heaviest rain. The lack of ventilation options and the shortage of pockets is a serious omission, but if this is not important to you the Sprayway Anakin Pro Shell Jacket for Men is a real contender for your hard earned cash.